Yes, the name is a bit of a attention-getter, but when you come to understand the purpose behind Lockheed Martin’s new spacecraft, the description does appear to be quite apt. It’s known as MAVEN, which stands for Mars Atmosphere and Volatile EvolutioN, and it is currently being produced in Lockheed Martin’s Martin Space Systems facility in Denver, Colorado. People may recall how earlier this year, MAVEN was mentioned as part of the “Going to Mars” campaign. A project that is being organized by the University of Colorado at Boulder’s Laboratory for Atmospheric and Space Physics (CU/LASP), the Martian orbiter will be carrying a DVD featuring the names of everyone who applies, as well as three specially-selected haikus. 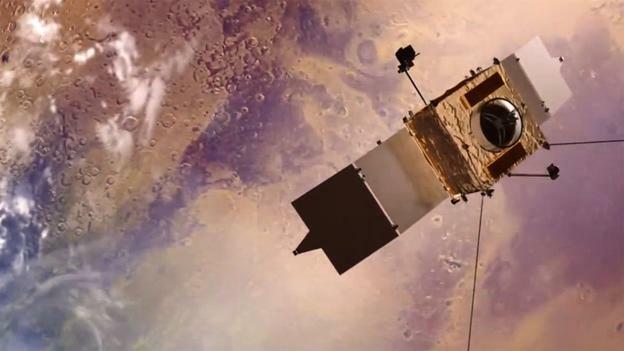 However, it is MAVEN’s larger mission which is now the focus of much interest. Later this year, NASA will be launching the orbiter to Mars for the sake of examine the atmosphere and answering some burning questions that remain about the planet. Thanks to evidence provided by Curiosity, Opportunity, and other missions, scientists now know that the Martian surface once boasted conditions suitable for life, including liquid water. What we know from our missions looking at the surface of Mars is that there used to be water there. We can see the outlines of ancient rivers, the shorelines of ancient oceans. But water can’t exist there now – the atmosphere is too thin and too dry, any water would just evaporate or freeze. [The atmosphere] used to be thicker, warmer, wetter, now it’s thin and dry. How did we get there? In a sense we are building a little bit of a time machine. What we’re doing is understanding the processes. 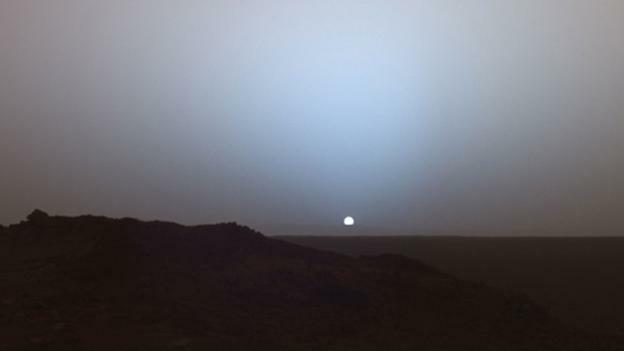 Just last week, evidence provided by the Curiosity rover supports the theory that Mars may have lost most of its atmosphere billions of years ago. 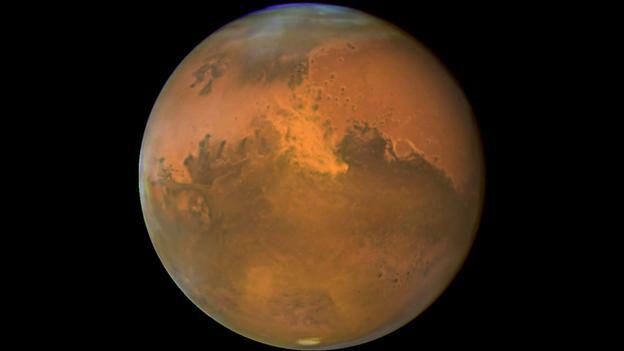 Still, scientists remain skeptical that Mars once had an atmosphere comparable to that of Earth. Today, that atmosphere is roughly one-hundredth the thickness of Earth’s, made up mostly of carbon dioxide and a tiny fraction of water vapor. What little remains is being stripped away by the solar wind. And unlike Earth, Mars does not have a magnetosphere to protect its atmosphere from being blown away – at least not anymore. Such a fragile, thin band around is now unlikely to support any sort of life, as far as we know. But the atmosphere in the past must have been more substantial to allow the formation of rivers, lakes and oceans. 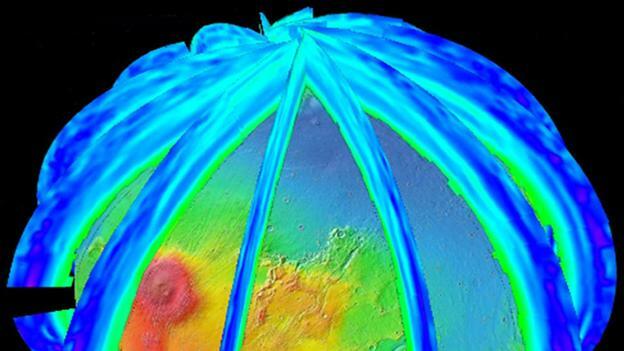 We think that Mars used to have a magnetic field. We see places on the surface that retain some remnant magnetism, they were imprinted when they formed with whatever magnetism was there. We think that some four billion years ago, when the magnetic field turned off, that turn-off of the magnetic field allowed [for the] turn-on of the stripping by the solar wind. 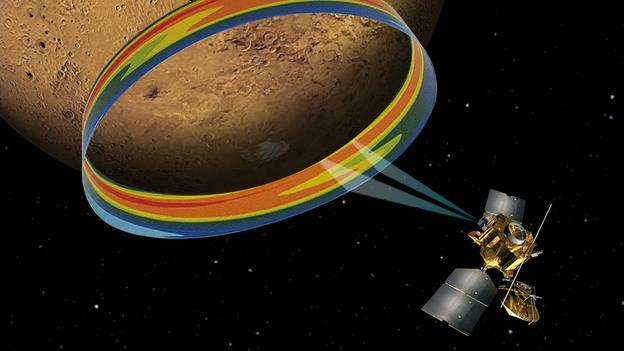 To investigate the processes taking place today, Maven will dip into the Martian upper atmosphere with each orbit, measuring the particles, sampling gases, monitoring the magnetic field and solar wind. Whereas the rovers have looked at the atmosphere from the ground up, MAVEN will look at it from the top down. At this point, both are needed to put together a picture of what’s controlling the Mars environment. In trying to understand the distribution of life throughout the Universe, this is a really important indicator. Understanding the environmental conditions that allow [life] to exist, or don’t allow it to exist, is key to being able to extrapolate elsewhere. What’s more, understanding what happened to Mars will provide some key insight into the history of our Solar System, and how it went from being a star with two planets that had oceans and atmospheres to just one. Knowing why things continued to operate on Earth, while on Mars they went horribly wrong, is likely to be quite the eye-opener, and make us all thankful we evolved here on Earth. MAVEN was named after the professor from the Simpsons, who is always ending his sentences with “Maven”.